Day 1 of Ignite 2018 brought us new capabilities for modern intranets. SharePoint and Office 365 are ready to deliver engaging modern, mobile-friendly, intranets in the cloud. Attending Microsoft Ignite is a bit like drinking from a fire hose — the sheer number of announcements and great new capabilities is overwhelming! Here are some of my very favorite intranet announcements from Day 1. Modern communication site as the root site! One of the most important sites in Office 365 is the root site in your tenant. Until now, the root site has been a classic team site. A big announcement today is that the default root site for new tenants will be a modern communication site. A key ask from corporate communications teams has been the ability to publish and promote organization-wide news in SharePoint. Microsoft just announced the ability to designate one communication site as the official news portal for the organization. News posted to the official news portal gets a special indicator so that it is easy to tell — both on mobile and on SharePoint home — which news posts are coming from the official news portal. Another cool update to News is the ability to bring internet news into the News web part with a URL link instead of a page. This capability is already available in Targeted Release tenants, and in addition to allowing you to bring in links to external articles, you can also tag the article page with the same metadata you use for the other pages in your web part. News is getting another update that I am not totally crazy about — the ability to have news rotate in a carousel. I don’t love carousels, but every communications team I work with seems to want them. Before you try adding this to your site, I recommend a quick visit to ShouldIUseACarousel.com. Use a carousel at your own risk! The ability to create page design layouts to make it easier to build pages using a consistent layout. New attributes for pages, including the ability to add an Author for a page who does not necessarily have to be the same person who created the page and new image capabilities in the page header. The ability to show both the author and the published date for the page in the header. The ability to associate a company-defined image library to restrict images to “brand approved” images. The ability to add background colors to sections. Using all these new capabilities will require some restraint — because trying every new feature on every single page is not necessarily going to help get your message across. Page authors still need to use good judgement and focus on great content thoughtfully created for scanning and skimming online. Buttons, tiles, and icons, oh my! The Quick Links web part is getting some awesome new layouts. You can now add an icon to links and display links as a simple list, a button, a grid, and a tile in addition to the current compact and filmstrip layouts. The layouts are also going to allow page editors to choose different background colors based on the site theme. This creates even more ways to tell visually compelling stories — with no custom code! The ability to target content to different audiences was one of my favorite “classic” SharePoint features, and it’s now coming to modern sites. We will soon be able to target content to users based on AD Group membership, including dynamic groups. One of the coolest ways to apply this capability will be in the ability to create “Me” content on your intranet home page and other sites. For example, we will be able to create content that shows organizational news and other enterprise content on pages, along with personal my tasks, my meetings, my email, and my recent sites and documents. This is a fantastic “out of the box” capability that will allow organizations to more easily drive traffic to intranet sites because sites will be personalized for each individual user. Employee engagement could be one of the top buzzword bingo terms at Ignite. Not only can organizations improve engagement with great new personalized content, but one of the key engagement web parts is getting a long-awaited improvement. Last year, the Yammer web part got some modernization with a mobile-friendly display that had only limited value because it didn’t allow users to interact with Yammer content. The classic web part didn’t work on mobile devices, but it showed conversations in a nice threaded display with the ability to engage — but only on laptops and desktops. The new Yammer web part combines the best of both worlds — a mobile-friendly web part that allows users to interact with Yammer directly in SharePoint. This is a super exciting improvement in user experience that doesn't force site owners to make a painful choice between the classic and modern web parts. To learn more about the current Yammer web part dilemma, check out Sarah Haase’s recent blog post about the trade-offs between the two current options. I’m really happy to see this choice finally go away! Video is another important tool for employee engagement. Stream is also getting some welcome additions to make it even easier to leverage video in the organization with a mobile app and the ability to download video to review offline. One of my favorite announcements today is the ability to roll up events from more than one site. Just like with the News web part, you can now select a source for Events that includes all sites in a hub or selected sites in the tenant. Almost every one of my clients has asked for this capability. I’m absolutely doing the happy dance for this simple but important announcement! 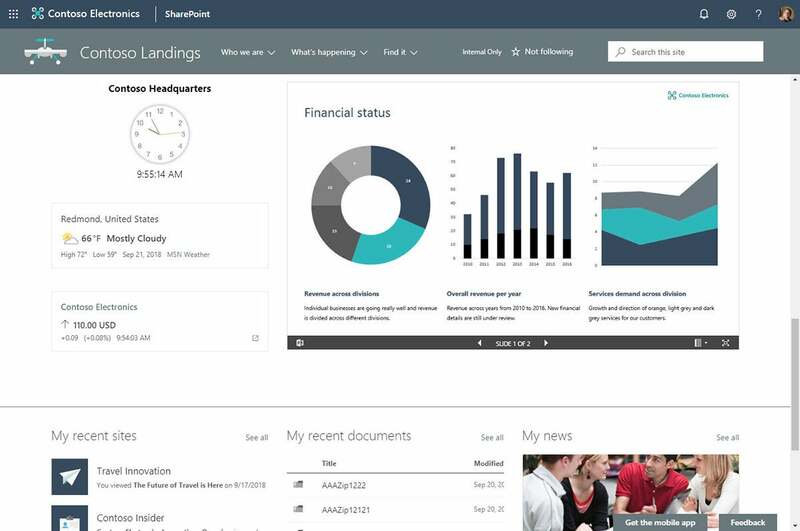 My final favorite announcement is super exciting for information architects — SharePoint sites are getting the ability to create mega-menus for navigation! Initially, mega-menus are site-specific, but with the ability available for individual sites, you know that global navigation can’t be too far down the road. There were also some amazing announcements about search today, but for intranets, it is still the case that the vast majority of users still expect to be able to browse for content and navigate to find what they need. Adding the ability to create mega-menu navigation without custom code is a fantastic addition to the native, first-party capabilities for intranets in SharePoint and Office 365. Also launching today is new guidance for planning navigation for intranets and SharePoint sites for which I was the principal author. The guidance addresses how to organize navigation links to create great information architectures. The guidance will help you plan how to organize your navigation links to create great browsing experiences for your users. My head is already exploding with all the great new capabilities for intranets that were announced on just the first day of Ignite — and there is more to come later this week! “We believe that the landing page for your organization — your company’s intranet portal — is one of the most important digital employee experiences you’ll create. We believe that the experience must be dynamic, personalized, social, and actionable. We believe the experience must express the brand and properties of your organization. And we believe, with the innovations we are disclosing at Ignite this week, you can build it with SharePoint,” says Dan Holme, director of product marketing for SharePoint and Yammer at Microsoft. 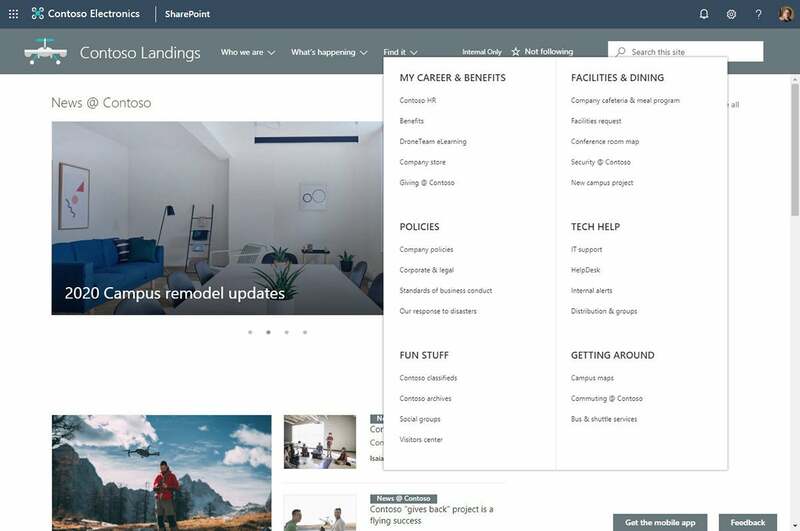 If you have been waiting to re-build your intranet on modern SharePoint sites, the time to jump in is now. Organize your sites, groups and content with hub sites, shared navigation, and unified search. Use great new AI-powered web parts to deliver dynamic, personalized, and relevant content without having to write custom code. Create digital employee experiences and portals that are easy to create, beautiful, fast, social, and mobile. For a complete list of the Day 1 announcements, read Jeff Teper's blog post. For some great resources to help build your modern intranet, visit Build your modern intranet on SharePoint in Office 365.